They're wildly popular, writes Scott Cohen, but he's seen enough problems with salt-chlorination systems in his role as a construction-defects expert witness that he thinks it's wise to make homeowners aware of the possible drawbacks that can be associated with saline technologies. 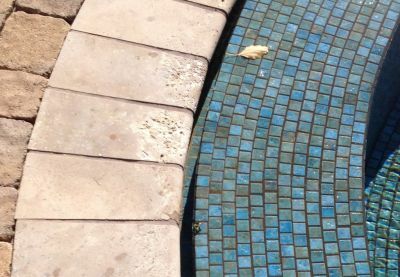 In my work as a construction-defect expert witness, I’ve seen how damaging salty water can be to hardscape materials around pools and spas equipped with saltwater chlorination systems. It’s so common that, personally, I now try to avoid using those devices on the watershapes I design and build. It’s not that I think saltwater chlorination is intrinsically evil; instead, it’s the fact I’ve seen so many different things go wrong with watershapes that have these systems that I decided some time ago that they weren’t for me. It’s often said that water is the universal solvent. Salt, my friends, is the near-universal corroder. 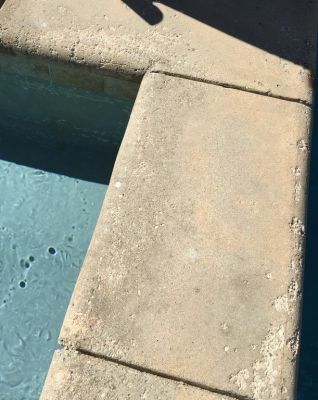 The scenario: In my forensic cases, I’m often called to pools and spas with damaged stone or concrete coping and/or decks marred by pitting, pop-outs and discoloration. The common factor in all of the images seen with this article is the presence of salt chlorination systems. The damage seen in this and the other photos accompanying this text is caused when salt penetrates fissures and gaps in the surface. As water evaporates, salt crystals are left behind to grow and ultimately fracture the material, whether it is stone or concrete. The resulting delaminations and pop-offs are unsightly – not anything that makes a poolowner happy. Salt is a particular challenge to any form of sedimentary stone (including the slates, sandstones and flagstones that are so popular around pools and spas), but it’s also an issue with poured concrete: When water splashes or drips onto any of these materials, it penetrates their surfaces, evaporates and leaves behind salt crystals that grow and eventually infiltrate and break the bonds between the sedimentary layers of many types of stone and within fissures in a concrete surface. This causes flakes to slough off or small bits of material to separate from their surfaces. In many instances, designers and builders are aware of or have observed these situations for themselves and will carefully discuss the issue with their clients. Most often, this involves advising the client to hose down surfaces around the pool or spa immediately after use to rinse away or at least dilute the saltwater. If the homeowner listens and follows through, that’s great – but unusual. And eventually the contractor may hear from an upset homeowner who is displeased by the deteriorating aesthetic appearance of what were once beautiful surfaces. The fix: None of the remedies here is particularly pleasant. One approach might be to get rid of the salt system, empty the pool and start over with non-salted fill water, but that leaves the already-corroded coping and decking behind. You could power wash the surfaces to clear away compromised material and then apply a sealer, but that doesn’t take care of the corroded appearance and tends to make areas around the watershape quite slippery, which is obviously not desirable. Finally, you can keep the salt system, remove the damaged surfaces and replace the coping and decks with other materials that are impervious and therefore resistant to salt damage. I know of one company – Artistic Pavers of North Miami Beach, Fla. – that offers attractive coping and paver materials warranted against salt-related damage, and there may be others.None of these is a particularly inexpensive solution, but something needs to be done because, left alone, the conditions that are already objectionable will only get worse. Lesson Learned: As stated above, I now do what I can to avoid using salt chlorinators. If I have a client who insists on having a salt system, I can live with it – but this means that I’ll specify materials that I know won’t be harmed or corroded by frequent, repeated and extensive contact with salt. This crosses whole classes of beautiful, much-in-demand decking materials off the list along with common metal fittings and components and anything else I can think of that might be damaged by steady salt contact. My recommendation is simple: When homeowners (and contractors!) 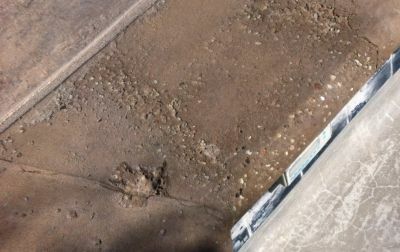 decide to install salt systems, they need to educate themselves on the special maintenance required, the potential for hardscape damage and possible problems with metal components – all of the pros and cons, and in detail. This way, homeowners are making informed decisions. And when they simply must have salt, contractors should protect themselves by presenting their clients with a detailed disclaimer – signature required! Some people absolutely love their salt water systems. Although we don’t recommend them at my company, if it’s what a client really wants, we’ll do it. Have you seen the paving and coping issues with salt in all climates? We are in the upper midwest and I have not experienced issues with paving or coping on salt water pools. I have heard of other builders having major issues like you have described in warmer climates. Just curious. Why not develop a "Salt Water Pool" advisement/disclaimer statement that the owners must sign (or include it in the contract), absolving the designer/contractor from liability if the pool is ever operated as a salt water pool? I have seen a disclaimer floating around on the web. I think that one of the Genesis Platinum guys had one they were sharing (sorry, I do not remember exactly who). Many pool builders are actually refusing to install them all together due to other issues like electrolysis and galvanic corrosion that is occurring. Contrary to the recent article in Pool & Spa News (by a salt chlorine generator manufacturer), SALT is directly responsible for many of the detrimental effects seen in and around swimming pools. None of these conditions even existed UNTIL people started putting high doses of salt into their pools. Scott did a great job discussing the corrosive effects of salt on masonry, copings, and concrete. However, he did not address how salt can corrode the metallic components as well. BTW: Adding a sacrificial anode to the pool is stupid. It is just introducing another metal into the water (sacrificing itself, instead of the valuable pool components) that will stain, plate or deposit itself in some unwanted location. Sorry for my English. It´s not perfect, but I hope you understand what I mean. My company manufactures a lot of pool accessories out of stainless steel. Salt Water treatment is getting more and more popular in Europe. The problem: everybody loves to get rid of chloridium products, but nobody wants to deal with the results of substitute products. My expirience with salt water treatment is very easy to explain. As long as you use stainless steel products in or at your pool, don´t use this kind of system. 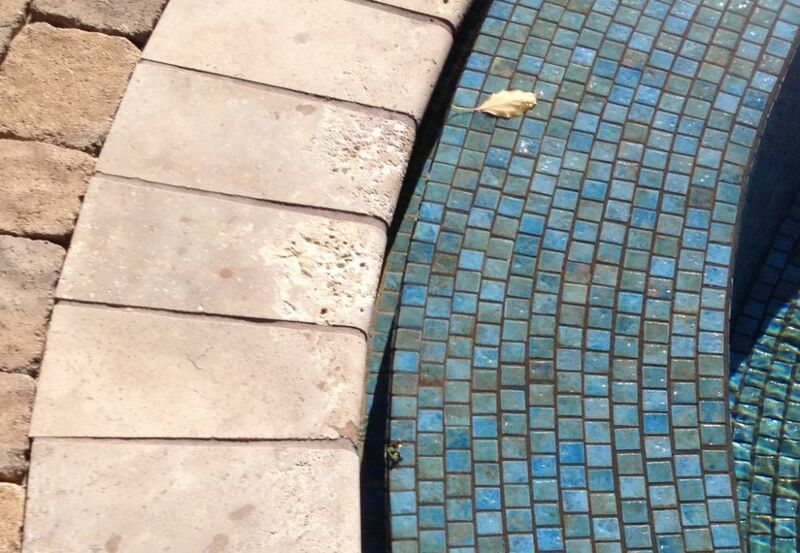 About 50% of complaints with rust and corrosive trouble come from salt water pools. Out of this reason we are telling our customers they have to decide: salt water treatment or stainless steel products. Both in one pool is not a good idea. I couldn't agree more. When on a customer consult I educated them fully on the pros & cons of salt chlorinated water. We are strongly considering some of the options such as a disclaimer/waiver should a customer insist on salt generated chlorine. The difficulty in evaluating the effectiveness of salt systems in the field or the cause of the salt damage is we really don't know if the pool is being maintained properly when doing only a single site inspection. Perhaps the pool man is putting in twice the amount of salt required and it is the higher concentration causing the problem? Maybe it wouldn't be an issue at all if it were maintained properly? Is that why some Contractors have horror stories, while others never had a problem? 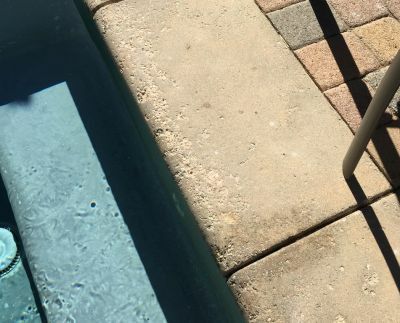 We do know that on pools that are actively used, where kids are splashing around alot, or pets swimming and shaking off as they exit the pool, that we see a lot more hardscape damage caused from Halite crystals (from salt buildup) over time. Some clients feel the benefits outweigh the damage potential. The important thing is to have the conversation and then back it up with a written disclaimer. Disclaimers can discourage someone from filing a complaint against you, but when things go wrong, I have seen lawyers spin this into; "Mr. Contractor, you knew it would be a problem and yet you did it anyway? And charged my client extra for the damaging equipment?" It is still my position that if you are going to offer salt systems, at least sign a disclaimer to prove it was discussed in advance. Scott It is always good advise to be honest with your client . Good for them and good for you. The theme of the article ,however seems to be that this is not a solvable problem, and there are no remedies to prevents this deterioration process. This is simply not true. As President of Concrete Preservation Systems and Senior Consultant to the Aquron Corporation, Aquatics Division, i can assure you that there are ways to address this problem. I have been in the business of protecting and preserving concrete and natural stone surfaces for over 25 years. Along the coast of Florida we have addressed salt attach on seawalls from saltwater that have salt content of 30,000 ppm. An average salt water pool may have 3,000 ppm and some testing has indicated that you will only begin to experience issues at 6,000 ppm and above. a lot of equipment now indicates a warning for fresh water use only. Other equipment manufactures have addressed the galvanic corrosion dissimilar metal problem that are used for salt systems. Regarding the protection of the coping ,concrete or deck areas around the pool , Aquron, Aquatics Division has many product that will protect and preserve these surfaces. This is a great example of why strong communication between the client and the pool builder is important because there are trivial things to discuss about. Salt systems should have approval on both sides and everyone should really know the benefits and risks of it. Great article! Scott I agree wit you. Brick work seems to break down when around Salt Chlorinators. I have found by using a low salt chlorinator it dose not give us that problem. Pure Silk have a Clorinator that operates efficently at 2500ppm. I have pools that are over 10 year old that are less then 1m from brick home and no damage has occured. It is food for thought and tell me what you think.